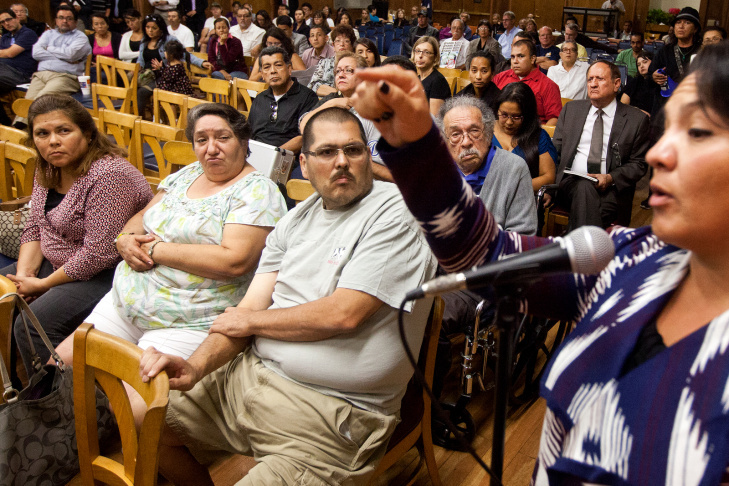 Community members listen during a public comment session at a town hall meeting about the future of the Exide lead-recycling plant in Vernon. In October, state toxics regulators struck a deal allowing the embattled Exide battery recycling plant in Vernon to stay open. As part of that deal, the company agreed to pay for people who live near the plant to have their blood tested for lead. But more than five months later, those blood tests have yet to begin. Under the deal, the responsibility for administering the tests falls on the Los Angeles County Department of Public Health. The department originally said itÂ hoped to begin the blood tests within a month. But on Wednesday, a health department spokesman said the blood-screening program is still being worked out. He said it could launch as early as next week. He could not immediately explain the reason for the months-long delay. Community advocates say residents may begin to feel a greater sense of urgency to get tested after toxics regulators this week saidÂ elevated concentrations of lead were found at dozens of homesÂ near the Exide plant. â€œI think itâ€™ll be a crescendo,â€ said Father John Moretta of the Resurrection Catholic Church in East Los Angeles. Moretta has been vocal at public meetings about the potential hazards coming from the Vernon battery recycler close to his church. He said he plans to encourage members of his congregation to get the blood tests. Even so, it remains unclear how the county plans to use the data it collects from the tests, or even how it plans to advise parents in the event their childrenâ€™s blood tests indicate lead exposure. UCLA toxicologist John Froines said even negative readings may not mean a person has not been exposed to lead. Blood tests only measure exposure over the last four months. Over the long term, lead can accumulate in bone. Even if a blood test indicates a presence of lead, Froines said, the way the county is conducting its testing â€“ on people who come forward voluntarily â€“ will make it impossible to know whether the Exide plant is to blame because there may be other sources of lead in the community. â€œBlood lead is irrelevant,â€ Froines said. Instead, he said the county should be conducting a scientific study to find out whether living near the Exide plant puts people at greater risk of lead exposure. Lead exposure in young children is known to impair cognitive development and lower IQs. Correction: Due to an editing error, a previous version of this story incorrectly stated the month in which the agreement to provide the blood tests was reached. The text has been corrected.